Beautiful beachfront home with panoramic ocean views, located on the Isle of Palms. This southern home is situated under old island oak trees and decorated with cheerful beach colors and Charleston based art. Kitchen has small breakfast bar with granite counter top. Dining room table seats 8 and is open to the living room. Living room is open with flat screen TV and ample seating for everyone. Stepping out on the screen porch there are rocking chairs and outdoor dining table with hammock. On the third floor is a master suite with a spacious master bedroom with private sundeck, ensuite bathroom with oversized Jacuzzi tub. Backyard offers great green space for family games. Back yard beach path through the dunes to the beach. This property offers a gas grill located under the house (propane tanks can be exchanged at our office during regular business hours), WiFi and linens included. No smoking or pets please. Fireplace is not for guest use. Bedroom 3 - Queen bed w/private bathroom (shower only); TV. Bedroom 4 - Master suite with king bed with ensuite bathroom with double sinks and large Jacuzzi tub, separate shower. Open sundeck off master bedroom with ocean views. The perfect location for a long weekend at the beach. The house was very well equipped and comfortable with a wonderful screened porch. Our only concern would be if the weather had been any warmer the AC would not have kept the house cool. Such a lovely home close to the beach and close to any amenity you could wish. It is right off the main road and on the beach. This is a 4 Bd,3 ba home with a wonderful yard to play or soak up the sun if you wish to not be in the sand. the beach is right over the dunes. All supplies that are needed for in home cooking are available, washer and dryer off the kitchen are a wonderful asset to the rental. The bathroom in the queen bed bedroom is quite small and good for one person at a time so plan getting ready appropriately. I would add that this home could have been cleaned quite a bit better as there was some mold in the bathroom showers, we found dirty towels left under a bed and there was quite a bit of dust. For the price this was a great rental. We stayed 56 days at 2600 this past Jan and Feb. It was wonderful to be right on the ocean, to wake up to the roar of the sea and to watch the light dance and the giant ships move in and out of port. It's a comfortable and spacious property. We loved it, needless to say. The beach is fabulous. The "front yard", the size of a football field. 2600 is, however, a bit worn, having been built in the late 70's and rebuilt after Hugo. I must have replaced six or seven light bulbs--over the stove, above the sink(it still doesn't work right), in the bath, outside the front door. Some of the faucets are vintage and a bit corroded, as are several sinks. The kitchen looks great, but is vintage 80's, too, and a bit dowdy. It is well equipped, however, if you're into cooking. ...uh...semi-clothed. And, 2600 is the perfect place to do that. I'd re-rent 2600 in a nanosecond. It's worth every penny. Thank you so much for your review. We value our opinion. Yes this property is old southern charm with great space for everyone and is situated at a beautiful point on the beach with amazing views. We cant wait to see you again soon. The owner has plans for adding a private board walk over the next several months. Great vacation home, well located, wonderful porch with rockers, plenty of space inside to spread out. Have rented this house before and hope to again. Many thanks for attending to minor issues so quickly. Thank you so much for your review! We are so glad you had a great time, we look forward to seeing you again soon! This house had lots of charm and was just flat out relaxing. The layout was good for our family with small children and the porch in the evenings had a fantastic breeze. We loved being so close to the beach and the walkway over the dune was a little rough but was not as bad as some of the reviews made it seem. The master had amazing views and a huge bathroom. The kitchen and the bathrooms all need updating but it didnt detract from the experience. This classic beach home sits amongst massive mansions but I am glad to see the owner refuses to sell or bulldoze it as so many others have. This home is spacious and provides great comfort, however, as previous guests have stated, the beach access needs attention... we were unable to use the direct beach access our entire stay. We enjoyed our time at IOP and Island Realty made check-in/out an easy process. Thank you for your review. Unfortunately we had, had considerable rain prior to your arrival. The beach access is not a boardwalk it is a path through the dunes. You may use the beach access here or there is also a public access just a few doors down. Please note the public access is also a path not a boardwalk. We look forward to seeing you again soon. The weather was great. House is in a great location and the beach is not crowded directly in front of the house. Kitchen needs to be updated and the crossing to Dunes is not preferred. However, overall the house is nice and accommodating. We love the front Beach location as well as being close to the town center. The front yard was big enough to play football or soccer. The master bedroom had it sound beautiful view. The big front porch was great for eating, relaxing evenings and late night conversations. The kitchen appliances could use some updating. We would definitely use it again. Great gathering space and lovely porch with ocean views. Fantastic location! The house was a bit older than those surrounding it, but if you're planning to be outdoors most of your trip it is a great value. Random note - beds were very comfortable :). A beautiful house at the perfect location! Just lovely – the house was awesome for a family – so everyone had enough room… The staff was very helpful at check-in -- no problems at all! I highly recommend! We love the house we stayed in. One minor issue came up and Island Realty took care of the problem immediately. They also got the owner of the property to ad ESPN to the TV options. The home is very comfortable with spectacular views of the ocean from both levels of the house. Great back porch with ocean views. Island Realty was very professional and helpful during the entire rental process. A great place to relax! We have rented this home several times. We enjoy the large screened porch and convenient beach access (although the direct beach access was not available this year due to hurricane dunes damage). The house is very comfortable, but we would recommend that the owners make one simple change: the placement of the tv in the master bedroom is very inconvenient. Would recommend switching the location of the tv/shelf unit with the round lamp table, so that the tv can be easily viewed from bed. Also, the path to the beach, with no boardwalk, is a bit rough, especially if you're hauling beach chairs and kids. Thank you so much for taking the time to post your review. We are so glad to hear you had a great time! We will take your recommendations to the owner. We look forward to seeing you again soon! Excellent-the home and property were perfect for our group. The beach beautiful, house comfortable, immaculate w/everything we could want. Would rent again. My wife and I and another couple decided for spring break to get out of the cold and relax in South Carolina. The house is cozy and convenient to Charleston as well as nice restaurants. A short walk to the ocean from the back deck. Island Realty and the owners of this home would like to thank you for being such wonderful guests! Thank you for letting us know you enjoyed your stay AGAIN this year! I wish we could have stayed longer!! We had a wedding to attend in Charleston and this was our first visit to the area. The rental was a great choice for us. We had rented two separate homes that accommodated other family members that were only 5 minutes (20 minutes walking on the beach) apart. The home was great for 8 adults and loved the extended flat back yard. Bring your bocce balls! The home was nicely kept and we really enjoyed the view. We came mid-February, so it was Spring-time in Charleston, with lots of daffodils and other flowers in bloom. We were able to drive into Charleston as well as Mount Pleasant for festivities. We shopped at Whole Foods and Harris Teeter, both very convenient. Also took in the sites of Charleston and a plantation visit. I wish we could have stayed longer, the home was very comfortable and super inviting!! The only recommendation I would make to the owner: The hot water heater could be set up at a higher temperature for the soaking tub. I do know that with new government regulations on the size of newly installed hot water heaters, the tub may do better with an instant hot. The best yard on the block! This beautiful home was exactly what we needed for our small family weekend. The back yard was like a football field and the house had so much room, especially the magnificent upstairs master suite with tub. Just wished we'd made time to use it! this is the third time we have rented this location. love it. we have rented several location at IOP through Island Realty. my family goes to the beach everu other Thanksgiving. looking for to 2018!! The path from the yard to the beach was very narrow and hard for young children to navigate carrying beach toys. Properties on both sides had wide wooden walkways to the beach. Thank you for taking the time to send us a review. Island Realty takes all suggestions directly to the owner. Also remember we have a complete staff that you can call during your stay to help you with any maintenance issues. We are glad you enjoyed the location and look forward to you calling us next year to try us out again! This was our first trip to Isle of Palms and we had a wonderful stay. The house is not fancy but very clean and comfortable. The location was perfect--a quiet part of the beach and close to Harris Teeter and other amenities. There are tons of good restaurants in the area and we visited Charleston most afternoons for a change of pace. The house is located right off the main street but it was surprisingly quiet and private. We have no complaints at all except the non-stick cookware needs to be replaces as it is flaking off into food. Thank you for the perfect vacation! Thank you for taking the time to post your review. We are so glad to hear that you had a great time. We have replaced the cookware that was damaged. Please know feel free to reach out to us about any issues we have, our maintenance staff is on call 7 days a week and are happy to help. We look forward to seeing you again soon! The location and rustic charm and updated comfortable amenities made our stay most enjoyable. The one drawback was that the television and internet were not working for several days. Thank you for taking the time to post your review. Being on a barrier island we can on occasionally lose service. I am sorry for any inconvenience this may have caused. We do our best to work with the cable providers to get things up and running as quickly as possible. Please know that we have our maintenance staff on call should you need any assistance. We hope that you will come back and visit us soon. View incredible. Beach and yard quiet and safe for children. Kitchen,furnishings and linens clean and convenient. Plan to rent same property again in 2 years and invite children and grandchildren again. Many restaurants, grocery stores and other businesses on the isle and in Mount Pleasant. Pleasant people to interact with in all businesses we went to. We liked having a large yard to play games in our own privacy, and the young children could run around and we didn't have to worry about disturbing other people. It was a very short,easy walk to the beach. We loved the master bedroom - while lying in bed (which is very comfortable) we could see the waves crashing into the sand, but could not see the people on the beach. The screened in porch is wonderful along with the hammock! There are holes in some of the screens which allows the geckos in. The house and furnishings are great and is very well stocked with dishes and utensils. The decks are in need of some maintenance as several of us suffered splinters in our hands and feet. The bedrooms with the twin beds do not have vents for the AC which can make it uncomfortable if you keep the doors closed at night, but they do have ceiling fans which help. Overall we enjoyed our stay and were very comfortable. We look forward to staying here again! Thank you so much for you feed back it means a lot to us! We will certainly look into the condition of the deck. We hope to see you again soon! Good location, nice house. I have never seen Charleston that crowded, but I guess it was spring break. Good time to retreat to the house and relax. Overall good experience. Check-in and check out was a breeze. The house was in need of a few repairs or 5 stars all around. Thank you so much for your feed back as we always value your opinion. We hope to see you soon! Great location. House is perfect for a couple families. Overall our experience was good. This was the fourth time to stay in this home, and the fifth time to say on IOP. This was our second year at this location for our family vacation. Would love to see a walkway over the dunes for easier access to beach. Also, update to pots and pans in kitchen would be a nice improvement. Overalll, a great place to enjoy yourself with family and friends. Thank you for your feedback. The owner has updated the kitchen cookware we look forward to seeing you next year! 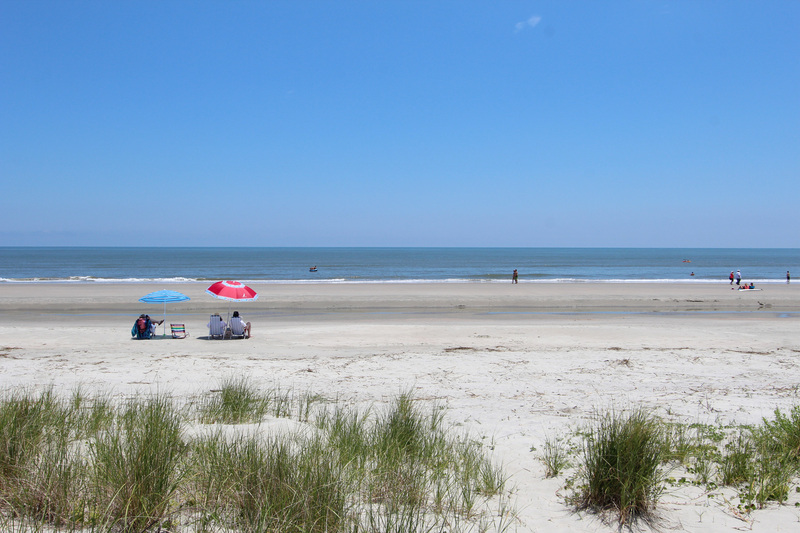 Great location on beach, near area of IOP where beach is shallow and tidal pools left during low tide. Easy walk out the back door to beach! Very clean, wonderful screened in back porch facing the ocean. Appliances older, but it is an otherwise wonderful house and would love to come back again. I love the Isle of Palms. Its location is perfect right on the beach and a 15 drive to beautiful downtown Charleston. Thank you so much for your review! Please come back and see us again!! We had an excellent time!! We got married on this trip. The location was perfect and beutiful. We loved staying at this property and hope to visit again as soon as possible!